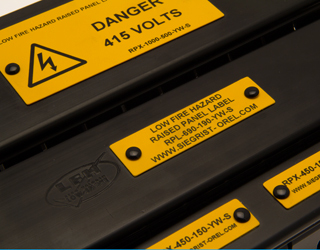 The iTag-RPX Raised Panel Label is specifically designed for the marking of instrument panels,control panels, electrical cabinets and racks. They are made from zero halogen, low toxicity, self extinguishing radiation crosslinked UV stabilised polyolefin sheet using OSNH grade material. It is mostly used for mass transit and underground applications where human life is critical as it features extended fire safety standard properties. The Raised Panel Labels are supplied on rolls for thermal transfer printing, which means production, storage and picking is easy and convenient. The adhesive is crosslinked and contains no Halogen or Sulpur and no nitrogen used in radical initiators.